The Chester diner opened on July 25, 1962 to great fanfare. It was built by the Manno Dining Car Company. It had a folded plate roofline, and a transitional exaggerated modern/ environmental facade, with large expanses of glass. The interior had a 115 seat capacity, with cantilevered stools and some of the wildest light fixtures I’ve seen. The Chester Diner is still with us, and is located at 67 Brookside Ave, Chester, NY 10918. 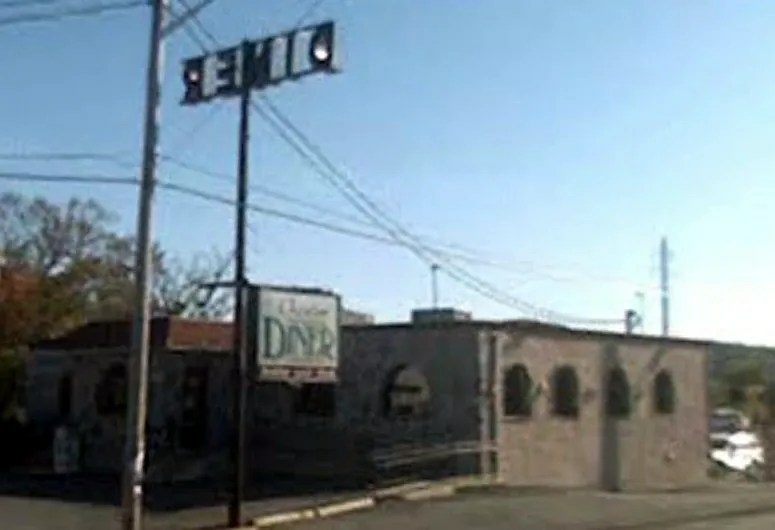 Here’s a lousy Google Streetview shot of the diner as it stands today. I can’t say for certain whether this is a replacement or a remodel, but my guess would be the latter. So many diners worthy of the Roadside Magazine Lou Roc Award. So little time. Most definitely. Add it to the list. The Chester Diner has been remodeled several times since I first became aware of it in the 1970s. The footprint appears very similar to vintage images, assuming the addition in the back was added later. I’m located just down the street and can send current photos of the diner. Clifton, What is going on with the others diners in the general vicinity? Any news from the last couple of years? I run http://www.nydiners.com and I have not really got down to that area in the last 2-3 years.